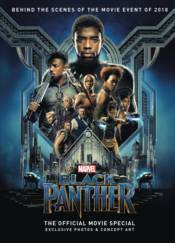 Black Panther - in theatres on February 16, 2018! Go behind-the-scenes with photos from the movie and stunning concept art, and discover secrets from the set with exclusive star interviews including Chadwick Boseman (T'Challa), Michael B. Jordan (Erik Killmonger), Andy Serkis (Klaw), Danai Gurira (Okoye), Angela Bassett (Ramonda), and Stan Lee (Stan Lee)! Available in Newsstand and Previews Exclusive cover editions, as well as a Hardcover!